NSString *filePath = [mainBundle pathForResource:@"MySong"
As you can see, the file’s data is loaded into an instance of NSData and then passed on to AVAudioPlayer ’s initWithData:error: method. Because we need the actual, absolute path of the MP3 file to extract the data from that file, we invoke the mainBundle class method of NSBundle to retrieve the information from the application’s configuration. The pathForResource:ofType: instance method of NSBundle can then be used to retrieve the absolute path to a resource of a specific type, as demonstrated in the example code. The audioPlayerDidFinishPlaying:successfully: delegate method of the audio player will get called on the delegate object of the player whenever, as the method’s name indicates, the audio player finishes playing the audio file. Now, this does not necessarily mean that the audio playback was finished after the whole audio file was finished playing. There could have been an interruption—for instance, the audio channel may have gotten occupied by another app that came to the foreground, causing your app to stop playing. In this case, the aforementioned method gets called. This is a great place to release your audio player if you no longer need it. 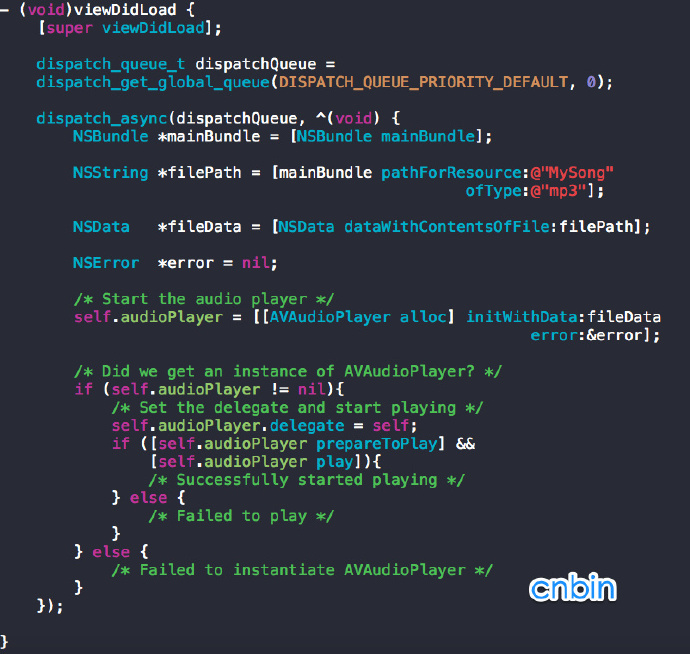 In the viewDidLoad method, we are using GCD to asynchronously load the song’s data into an instance of NSData and use that as a feed to the audio player. We do this because loading the data of an audio file can take a long time (depending on the length of the audio file), and if we do this on the main thread, we run the risk of stalling the UI experience. Because of this, we are using a global concurrent queue to ensure that the code does not run on the main thread. 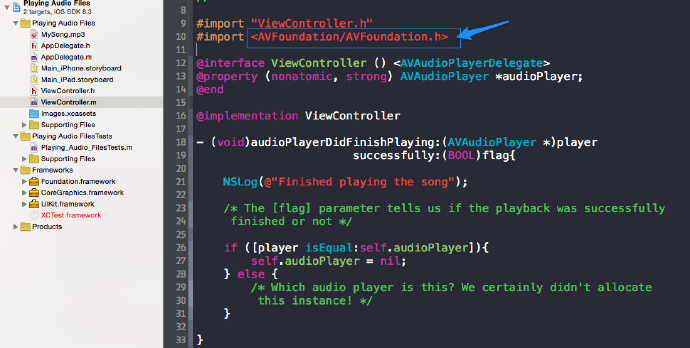 As you can see, we have made the view controller the delegate of the audio player. This way, we can receive messages from the system whenever the audio player, for instance,is interrupted or has finished playing the song. With this information in hand, we can make appropriate decisions in the application, such as starting to play another audio file.